A large, blank wall is the perfect place to exhibit your design sensibility and your personal interests. So don’t let an empty wall go unadorned. Our senior designers have these suggestions for how to decorate a blank wall. If you have a blank wall in your home, then use it to show off a side of your personality that isn’t on display elsewhere. And if you want to show your love for mother nature, then consider a living plant wall. A vertical plant wall requires less water than a regular houseplant, and takes up less floorspace. Check out the living plant wall we hung in the foyer of this penthouse overlooking Central Park West. If you’re decorating a large blank wall, then consider expanding your art collection. “Art goes on walls” isn’t the most revolutionary piece of design advice, but consider all the ways you can exhibit your digs. A collection of four prints from the same artist hangs in the mudroom of this Westchester family home, for a bold entrance to this dynamic house. If you’re looking for ways to dress up a blank wall, then consider some wallpaper. We’re particularly fond of geometric patterns, as they have a textured appearance without being overwhelming. In the foyer of this Upper East Side apartment, we lined the walls with a gold wallpaper, for a grand entrance to this luxurious home. If you’re decorating a wall within a confined space, then we highly suggest a mirror. It’ll make your space look more expansive, while also giving you the chance to accessorize your blank wall. 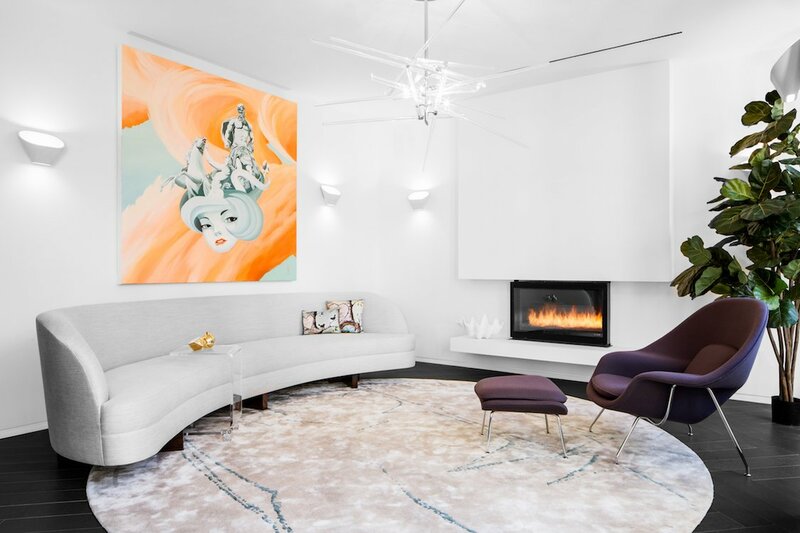 To match the art deco light fixtures in this Upper East Side townhouse, we sourced an opulent full-length mirror. If you’re looking for more places to exhibit your decorative wares, then consider turning your blank wall into open storage. Books, decorative objects, firewood and knick-knacks all fit perfectly on these black shelves. Just make sure that you keep your shelves uncluttered, so that your open storage shelves look curated and not haphazard. If you’re looking for a way to spice up a blank wall, then consider some new paint. You don’t even have to paint the whole wall. When Signpost asked us to redesign their office space, we gave each of their meeting rooms a band of bright, bold color. Not only did it spice up their office space, but it also helped them designate each room for different types of meetings. And if you’ve got an awkward wall space that you’re trying to decorate, consider decorative objects. We were faced with this exact challenge in this Hamptons home office. To reference the beachside locale of this home office, we selected a collection of rustic wood oars, and hung them as wall art.